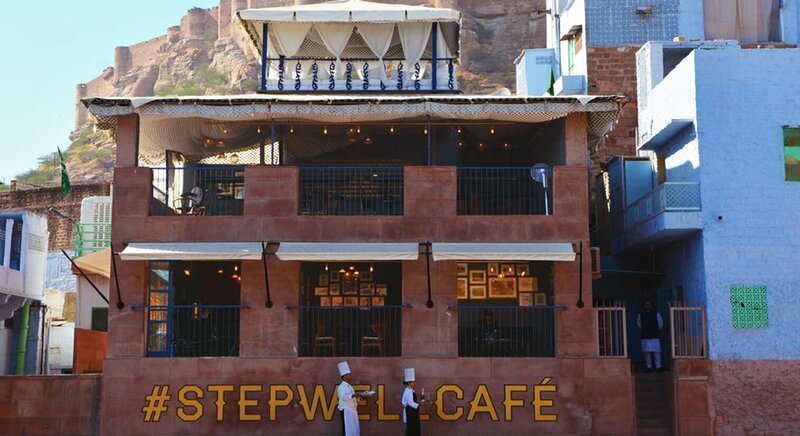 The #StepwellCafé is situated in one of the most unique locations in the world. Perched on the edge of Toorji's Jhalra, an early 18th century Stepwell it offers unparalleled views of this wondrous monument. 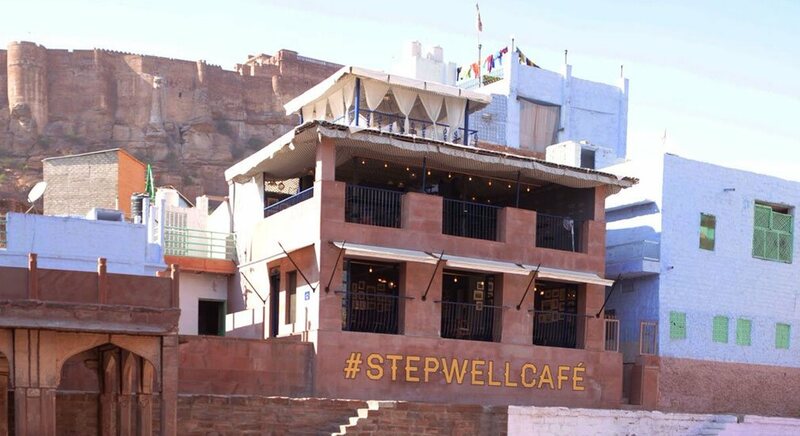 If you can steal your eyes away from the ancient architectural marvel that is the Stepwell, the Café also offers an excellent vantage point looking out over the famous Stepwell Square, and above to the magnificent Mehrangarh Fort, and beyond in to the bustle of life and the indigo-brushed blue rooftops of the famed Walled City of Jodhpur. 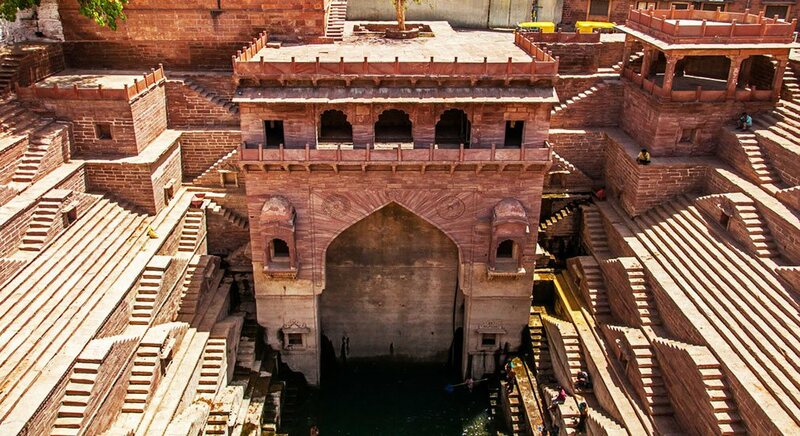 An absolute must visit in Jodhpur. Spread across three floors the ground floor is air conditioned and offers seated dining; the first floor offers al-fresco dining with modern bistro styled seating and at the very top the ‘Lounge-Machan' is the perfect 360° look out with repose sofas and white muslin curtains to chill or relax and refresh. Food and Drink is served on all three floors. The Interiors of the Café were designed by V. Sunil and Mohit Jayal of Weiden & Kennedy and Motherland fame, with the help of Askhat Bhatt of Architectural Dicipline; who wanted to create an atmosphere and a visual feast of the very best of Jodhpur combined with a swanky modern day flourish. Furnished by Krea, www.kreaworld.com; India's top furniture designer brings a contemporary twist to this medieval location with its cool vintage Edison filament light bulbs and high-bar look out points. Bedecked in traditional Royal Jodhpur tent styled covers with the famous JDH ‘star’ and the Marshal wafting out its cool tunes, the Stepwell House Café is THE place to be. H.H. Maharaja Sir Pratap Singh’s family, can be viewed across the Café and exhibits a fascinating collection of paintings, photographs, letters and documents detailing Jodhpur's glorious and glamorous past. The Timeline at the Café has become a must see - must read, when visiting the area. Spread across the walls of the first floor it outlines Jodhpur's magnificent history, beginning in 1459 AD when the great Roa Jodha thrust forth his banner and first broke ground on the high rocky hill of Mehran. The Café Menu offers a mix of Indian and Continental favorites and is accompanied by a well stocked bar. Serving Lunch and Dinner; and Snacks, coffee, tea and cocktails in between... Open to serve every day from 10am to midnight. The Full Menu is available here…. We would be delighted to offer you a table with or without a reservation (Subject to availability). Should you wish to, you can make a reservation for a table of your preference or we can recommend a table to your suiting. You can contact us for reservations here. A footpath from the Stepwell Square leads you to the Café, and is very well Signposted. You can also access the Café from the Raas. Map details can be found here. Parking is always available on request. The #StepwellCafé is uniquely positioned to offer unforgettable bespoke private dining experiences and cater for functions and events. You can choose to book out a specific floor or the whole house. Whether it’s a dinner for two, a large group or a big party, our in house Chefs would be delighted to create a one of a kind a la carte Menu specially for you and the Café team to create a uniquely themed ambiance to make your occasion with us the highlight of your celebrations and a memory to cherish forever.